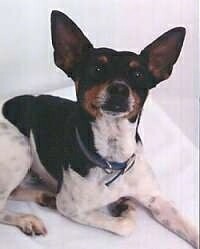 The Rat Terrier is a well-muscled dog with a deep chest, strong shoulders, solid neck and powerful legs. Its body is compact but meaty. The ears can be upright or tipped and are carried erect when the dog is alert. It can be born with a short or full-length tail, each being left in its natural state or docked at two days of age. The coat colors include pearls, sables, chocolates, red and white, tri-spotted, solid red, black and tan, blue and white and red brindle. Breeders concerned with working dogs are not as fussy about the specifics of the looks. The Rat Terrier is an intelligent, alert and loving dog. It is very inquisitive and lively. This affectionate dog makes an excellent companion for those who will enjoy an energetic dog. They are good with children, especially if they are raised with them from puppyhood. They are, for the most part, friendly with strangers. Rat Terriers make good watchdogs. These dogs are quick, very playful and are not yappers. The temperament of these dogs is pure terrier. The lively, feisty, fearless nature can be found in the best of terriers. They are eager to please and respond and pick training up faster than most dogs. The Rat Terrier is a very well-mannered, well-rounded dog. It is easy to train, very eager to learn and to please its owner. They love to go with you and to do what you do. They are also very good swimmers, not bashful or afraid and have no problem with the water. They make good farm dogs as well as excellent family dogs for pets and companionship. This hardy dog is used for hunting expeditions as well as terrier work. Adult dogs can adjust easily into families with or without children. Make sure you are this dog's firm, confident, consistent pack leader to avoid Small Dog Syndrome, human induced behavior problems that can include territorial issues. Always remember, dogs are canines, not humans. Be sure to meet their natural instincts as animals. The Rat Terrier comes in three different sizes. 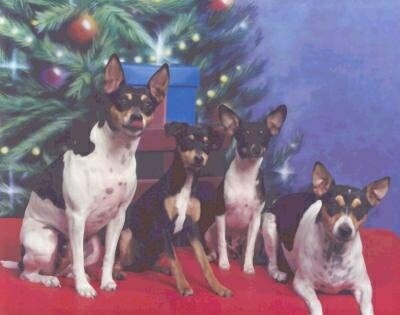 Rat Terriers will do okay in an apartment so long as they get at least 20-30 minutes of exercise a day. They are fairly active indoors and should have at least a small to medium-sized yard. Rat Terriers love to dig, and they can get out of a fenced yard relatively easily. Provided they have the proper protection, they are able to spend a good amount of time outdoors. They love to be inside the house and outside to play. The Rat Terrier needs a good amount of exercise. This breed needs to be taken on a daily long walk or jog. It should have at least 20-30 minutes a day, but would enjoy much more. The breed enjoys challenging games and outdoor romps. The Rat Terrier is easy to groom. An occasional combing and brushing to remove dead hair is all it needs. Named by the perceptive Teddy Roosevelt, the Rat Terrier was developed in Great Britain originally from the Smooth Fox Terrier and the Manchester Terrierin 1820. It was brought to the USA in the 1890s. At that time they were all their original color of black and tan. Life Magazine showed President Roosevelt with three black and tan Rat Terriers. American breeders crossed them again with the Smooth Fox Terrier as well as the Beagle and Whippet. The Beagle increased bulk, trailing and hunting ability, along with the red color. The Whippet contributed the speed and agility and probably the blue and brindle colors. The smallest variety was derived from the Smooth Fox Terrier and Chihuahua. 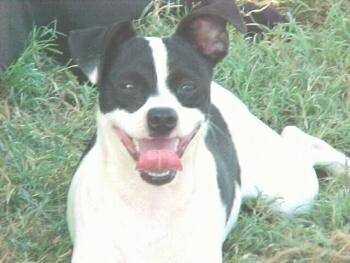 The Rat Terrier proved to be one of the best in the rat-baiting pits. One Rat Terrier is reported to have killed over 2,501 rats in a span of only seven hours in a rat infested barn. The Rat Terrier is a hard-working farm hand, able to rid an infested barn of vermin with no problem. The Rat Terrier was officially recognized by the AKC in 2013. 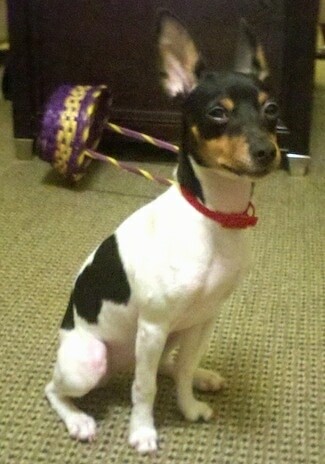 APRI = America's Pet Registry, Inc.
"Moo the Rat Terrier at 6 months old loves to jump and chase rolling balls. His name is Moo because his black spots make him look like a cow." Noel the happy black and white Rat Terrier laying down in the grass.